Now comes the tough part—checking whether it actually works. By that, we mean understanding whether or not your corporate travel program helps you achieve your business goals. And, equally important, whether or not it works for your employees. After all, travellers across Asia Pacific say the quality of their travel experience has a direct impact on the business results they achieve while abroad. That means you should have an evaluation and measurement system in place to track the effectiveness of your corporate travels and policies. A 2012 guide created for the Global Travel Business Association (GBTA) recommends that companies identify both key performance indicators (KPIs) and key metrics when managing and measuring corporate travel. KPIs prescribe how a corporate travel program should be; metrics merely describe the way it is. One can influence a KPI, while metrics are only defined after the fact. However, both work together to give you a clear picture of the effectiveness of your corporate travel programme and policy. Looking at the list above, you might realise that your business prioritises some categories above the rest. That’s to be expected. For example, you might prioritise ‘spend and savings’, ‘corporate social responsibility’, and ‘data quality’. If those are your KPIs, you’ll manage your corporate travel programme in a way increases policy compliance, minimises carbon footprint, and improves data reporting. The authors of the GBTA guide then developed KPIs for each corporate travel category. They rated each KPI as either simple or complex and weighted it based on the likelihood that a company would treat it as either higher or lower priority. Let’s look at some of these KPIs in more detail, and identify the metrics that help you measure your progress towards them. This KPI is expressed as the percentage of travel spend booked through approved channels. Depending on your corporate travel policy, booking can be done through a travel management company or through a specific booking platform. Ideally, all your corporate travel bookings—such as hotel rooms and travel tickets—should be made through approved channels. The visibility aspect of this KPI refers to the booking data the company obtains. When travel bookings are made through approved channels, it’s easy to access the data, as these will be supplied either by the management company or the booking platform. When travellers use channels outside of the corporate travel policy, though, data tends to get lost or to be unreported. By influencing this corporate travel KPI, you can save money on airfare. For instance, you may allow only economy class cabins, or allow the booking of business class cabins only for flights that take eight hours or fewer. To arrive at a non-compliance percentage, divide the amount spent on non-compliant cabin bookings by the total amount spent on all cabin bookings. This is pretty much self-explanatory. How satisfied are your corporate travellers with either your managed travel program or your self-booking tool? To calculate your traveller satisfaction rate, divide the average rating provided by your corporate travellers by the highest potential rating. You can gather this data by conducting a survey after every trip. It’s never a good idea to keep staff waiting for their corporate travel reimbursement. How many days pass by from the time the traveller files an expense report to the time he or she is reimbursed? Calculate the average number of days, and aim for shorter time periods. Companies must aim to have complete profiles for all of their business travellers. This includes, among others, a current address and emergency contact details. For each profile, you can identify certain data that are essential. Create a profile completion score for essential items, as well as for all required information. This KPI describes companies’ knowledge of their corporate travellers during a trip. This includes knowing whether they’re at the airport or on board a flight, and knowing their accommodation details and itinerary. Measure this by dividing the number of travellers for whom you have at least one location-related piece of data by the total number of travellers. To move this needle, establish clear reporting channels. Booking apps, for instance, automate the collection of data and enable travellers to send real-time updates to the company. At the end of the report, GBTA provides a reference guide for key programme metrics. Travel spend – compare travel spend across business units, regions, or time periods. Destinations – map out the number of trips between locations. Trip purpose – why do you travel? Do the trips fulfil these objectives and deliver the desired outcomes? Spend concentration – determine the areas you spend on the most, such as specific routes, flights, client meetings, accommodation, and others. Travel expense productivity – compare travel spend to your business’ sales and revenue. At the most basic level, ROI is calculated by dividing net profit by total investment and multiplying that number by 100 to get a percentage. As travel involves a myriad of activities, purchases, suppliers, and behaviours, calculating ROI can be tricky. For example, a business traveller may have secured a major contract during a trip. However, he/she spend five months prior to the trip negotiating with the potential customer. Despite the complexity, though, business must still measure ROI as it tells you if your corporate travel spending is worth it. KPIs and key metrics make sense for your organization, industry, and business goals. Discuss with your core leadership team, as well as different departments within your company, to figure out what KPIs to add to or remove from the list. You can also modify the definitions to apply them to your corporate travel programme objectives and travel patterns. At the end of the day, numbers are just numbers. It’s the context that transforms them into business drivers. Booking platforms like Travelstop help you discover critical insights on your corporate travel program by enriching the quality and completeness of travel-related data. You can find all data in one place, be they for flights, hotel rooms, itineraries, or travel spend. 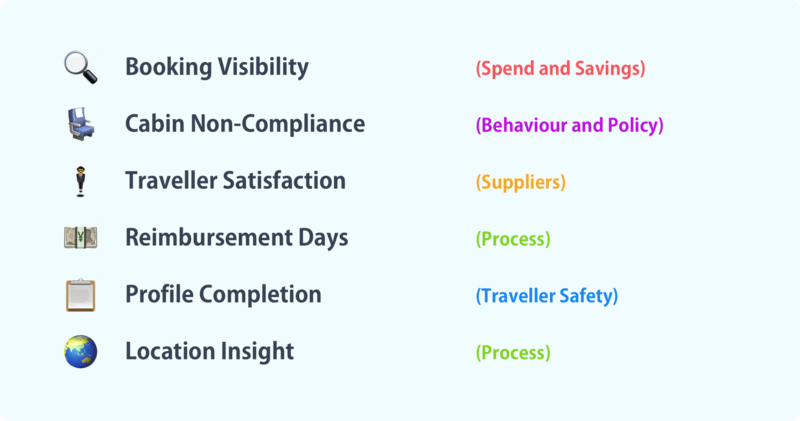 Monitoring corporate travel policy compliance becomes a breeze. It also makes the booking process efficient for employees. Apps help corporate travellers create complete profiles, booking flights and accommodation, and record and update their itinerary. In return, companies use the data travellers provide to improve the corporate travel experience and output. In the end, it’s a win-win situation for all.